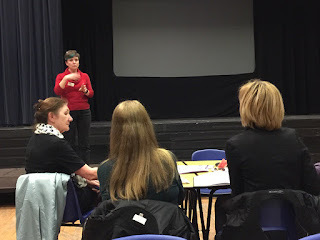 Yesterday (Tuesday 14th March), I presented an Ignite Talk to the CIPD Sussex Branch L&D Forum at Brighton & Hove City College, at the invitation of Janet Webb, of Janet Webb Consulting (@ JWebbConsulting), who was facilitating the event. "For learning events, content is more important than delivery." "Do coaching and mentoring programmes deliver value for money?" "What is the future role of L & OD?" "Classroom based learning is now largely irrelevant." Facilitated by Janet, our mixed group of some 20 participants, exercising the 'rule of two feet' (move on if and when you have had enough of any of the group conversations) shared their views and opinions and then came together to review the session. I was a little surprised to hear one to two people question the value of the exercise without predefined 'outcomes', and concerns expressed about how we were supposed to remember/retain any personal learning points. This led to a useful discussion about how to develop and maintain reflective practice as part of our toolkit, with references made to blogging as being helpful here. Incidentally, it's always good to see the Twitter community show up from outside the room in these discussions, as Janet tweeted out the questions and a couple of tweeps commented in. As it happens, only a few of us in the room last night are regular tweeters, so we encouraged the room attendees to consider joining in to the regular Friday morning #LDInsight tweetchat and I'm looking forward to seeing who shows up on Friday. All too soon, it was my turn to share my Ignite talk. For those who don't know, Ignite is an internationally-recognised templated speaking format, designed to encourage speakers to share topics and ideas quickly and concisely, using 20 slides, auto-timed to display for 15 seconds each, which makes an Ignite talk just 5 minutes! This was to be my second-ever attempt at delivering an Ignite talk; the first being at the CIPD Annual Conference in Manchester in 2015, as part of Andy Lancaster's first "Ignite Lab". Those of you who were 'fortunate' enough to have attended that session might just remember the paper trail I left all over the stage, reflecting the fact that I was under-rehearsed and under-confident on that occasion - but people (well, Sarah Harvey anyway) still remember my performance, if not the content, two years later. In contrast, for last night's event, I was very well-rehearsed, having learned my lesson in 2015! I spent most of the day practicing, editing, practicing, and repeating, to get the script, the flow and the timing as smooth as I could, whilst still delivering a coherent and well-paced talk - no easy task, believe me! And it's just as well that I did, because when it came to loading my slide deck and switching to 'presentation' mode, I was unable to see my notes on my own screen and had to rely only on what the audience could see on the big screen. (And no, I hadn't thought to print them out as a fall-back!) Janet was delighted! "That'll make it look even more spontaneous and authentic" were her last words to me as she introduced me to the room...! Well, I got away with it. Having rehearsed it so often, I was only caught out by one slide appearing where my mind went blank and I had absolutely no idea what I was meant to say at that point. I managed something vaguely relevant and that got me back on track. And then, it was over. And the audience grilling began...! What's an Ignite talk for? Why would you do it? Where does it fit? When would you do it? Does it have to be 15 seconds per slide? Is this the future of learning - rapid fire content delivery? Consider if and where Ignite Talks might fit into a larger programme or event - Setup? Opposing viewpoints? Summary and Calls to Action? Think of Ignite Talks as the presentational equivalent of a 5-minute tweet or indeed, a series of 20 15-second tweets. If you can't say/illustrate your story or message within that framework, it may not be the right tool for the job - on that occasion. The final session of the evening was facilitated by Sarah Harvey (@ SavvySarahSPM), who is also the Chair of the CIPD Sussex Branch, wherein we explored the 'Goldfish Bowl' technique of observed conversation, in this case a manager/team meeting, whereby the participants sit in the middle of a larger circle of observers and have their conversation. Particular character attributes are assigned to each participant, which they are required to enact during the discussion, whilst the observers are told to look specifically for Non-Verbal Communication, Tone of Voice, Words Used and Presence. A really enjoyable session and much respect to the four volunteers who stepped into the circle and played their parts so convincingly. Again, a valuable discussion followed regarding the usefulness of this technique, the case for using professional actors and the need for cultural understanding and fit in deploying it back in the workplace. Thanks to Janet and Sarah for keeping us on track and on time, and for a very engaging and participative session that got us walking, talking, sharing and learning together. And of course, this blog is my reflective work, which I will refer back to when I am doing another Ignite Talk, at this year's CIPD L&D Show 'Ignite Lab' on Wednesday 10th May. Come along and see a few talks so you can get a broader idea of their impact and usefulness.